10 day march to Albany in support of the Farmworkers Fair Labor Act. Blaring music, a light breeze, and high spirits marked the beginning of a one hundred and eighty mile march to Albany. The Justice for Farmworkers Coalition is sponsoring two marches that will converge in Albany on the 30th of April. The state legislature will be voting on the Farm Worker Fair Labor Act. 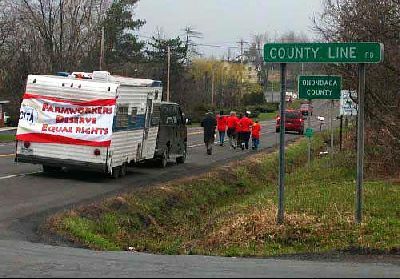 The western march left Seneca Falls Monday afternoon from the Women’s Rights National Park, they will make their way down routes five and twenty covering some of the most bucolic sections of upstate New York. They have been traveling this road for three days now and it will be their home for the next seven. The past sixty miles have not been all easy. Monday started out at a brisk pace as they were eager to show their dedication to their cause. After a wonderful nights sleep they felt refreshed for the day that lie ahead, but Mother Nature was not going to make it as easy. Tuesday was much colder and it was harder to walk. The rain soaked their clothes and worse their socks. It was a very soggy day, but the rain would not dampen their spirits. As the group passed bystanders and onlookers they shouted, “Si se puede” yes we can in Spanish. Wednesday the weather got worse, as the snow drove harder into their faces their determination forged them ahead. The suffering experienced over the past few days pales in comparison to that expereinced in the fields of New York’s farms. With that in mind the group steadily puts one foot in front of the other, with the idea that their pain connects us to those in the fields and hardens us for the task in Albany, “Without pain there is no struggle”, Salvador says in Spanish. The Farm Worker Fair Labor Act is not designed to give special rights to farmworkers. It is intended to grant them the same rights other workers enjoy across America, such as: a day of rest, the right of collective bargaining, disability insurance, and overtime pay. Some employees work over sixty hours a week with no overtime pay and no day off. It is this inequality that we hope to eleviate and will continue to march. Check back here for hopefully daily updates. As I find Internet access I will post updates. The photographs accompanying this article are by John Solberg, a participant in the march.